Captain Marvel's new Japanese poster has surfaced online and features Brie Larson as Carol Danvers aka Captain America in her action suit. However, the tagline on the poster has made many to believe that the film will surely tease the fans for the upcoming Avengers 4. 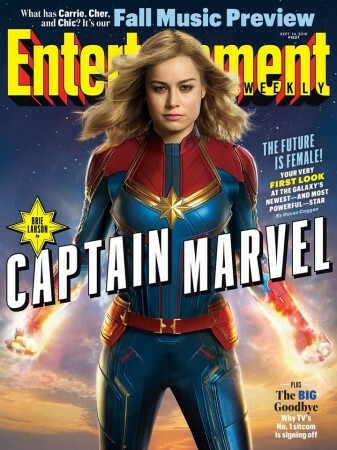 Captain Marvel is one of the most anticipated movies of 2019. For starters, the upcoming MCU movie is going to be the first full-length feature film to depict the journey of a female superhero. Secondly, the film will reveal how Captain Marvel will help the Avengers in their fight against Thanos. The upcoming superhero movie is set in 1995 and will feature a young Nick Fury (Samuel L. Jackson) and he will meet a superhero from outer space. Fans are speculating that his friendship with Captain Marvel will somehow give him the idea of assembling all the superheroes to fight against the evil forces. As per Screenrant, a new Japanese poster of Captain Marvel surfaced with a tagline that reads, "Lost Past, Memories Trapped, Powers Gained. Is this me? The Story before the Avengers." The earlier released trailer of Captain Marvel and this recently surfaced tagline has made many to believe that the Brie Larson's new movie will work as an origin to all the superheroes. Check out the teaser poster for Marvel Studios’ #CaptainMarvel in theaters March 8, 2019. In the previously released trailer, Captain Marvel was shown as a member of the Kree Starforce and after arriving on Earth, she has forgotten all her memories. In the trailer, Captain Marvel says in a voice-over: "I keep having these memories. I see flashes. I think I had a life here. But I can't tell if it's real." Meanwhile, Marvel fans are eagerly waiting for Avengers 4 teaser trailer to drop online. It was earlier speculated that Avengers 4 trailer featuring, Robert Downey Jr., Chris Evans, Scarlett Johansson, Chris Pratt, and others will be unveiled by Marvel during the Black Friday sale. However, that did not happen. Now, many are speculating that since Doctor Strange envisioned more than 14 million possibilities in Avengers: Infinity War, the first trailer of Avengers 4 will appear online on December 14th, the day when Marvel's Spider-Man: Into the Spider-verse will release worldwide. Captain Marvel is directed by Ryan Fleck and Anna Boden. It is scheduled to release on March 5, 2019, while the untitled Avengers 4 is all set to release on May 3, 2019.